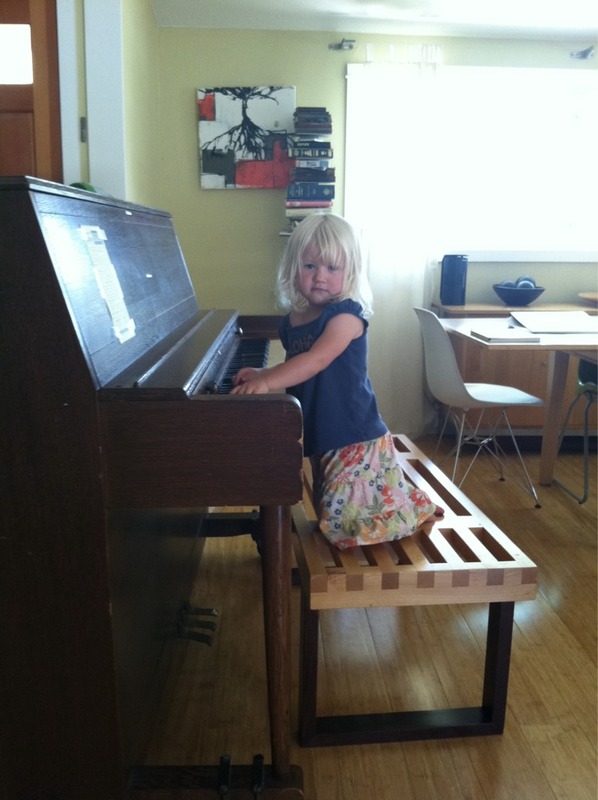 I’ve been wanting to get a piano for our house for almost a year now. We previously had a baby grand but it took up too much space, so we sold it and then my plan was to replace it with an upright. But Craig’s List . . . it’s just so much work with the calling and the appointment-making. 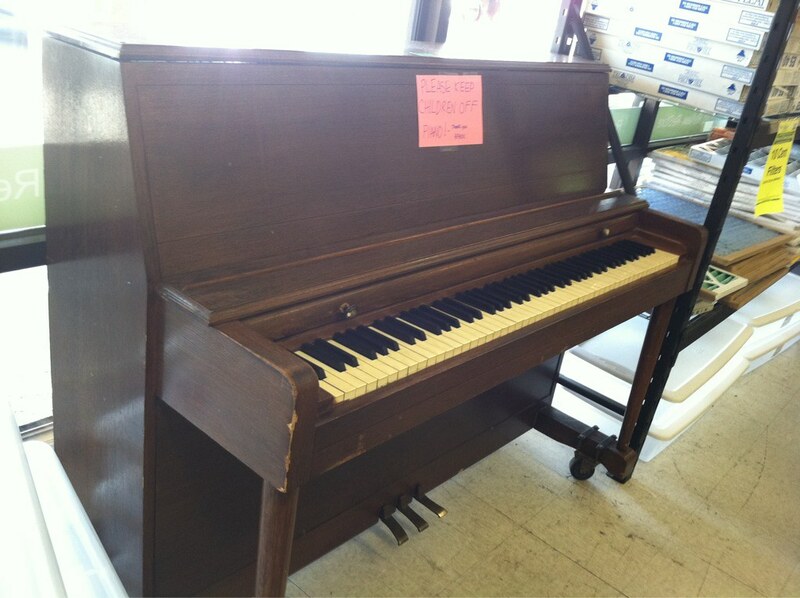 Finally, this week I found a piano at a local thrift store. Only $99! It’s really plain but that’s what I was wanting, because my plan is to paint it. Right? I even saw a yellow piano on So You Think You Can Dance last week. Yellow pianos are SO hot right now. I bought the piano on a Friday, and they gave me strict instructions that I had to pick it up by Tuesday or they would put it back in inventory. 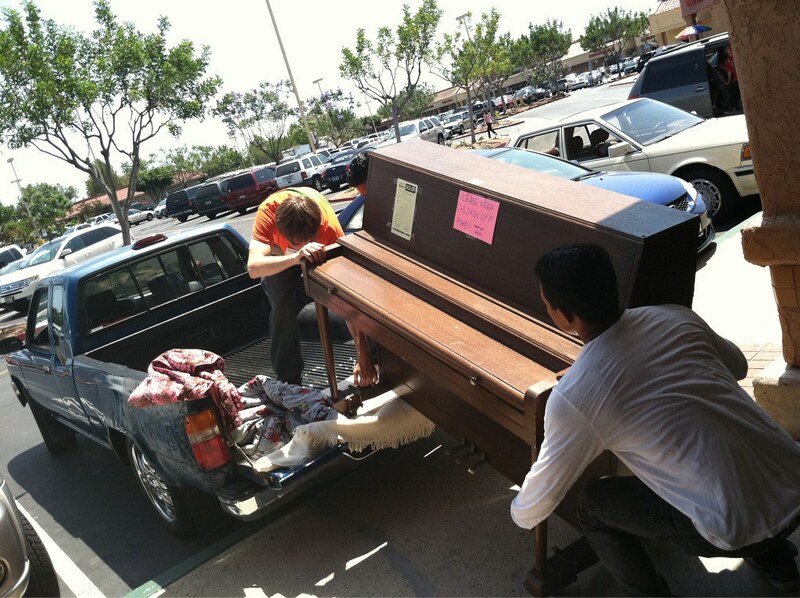 They actually wanted me to take it on the spot and make quite a to-do over the special exception they were giving me, on account of it being a HUGE PIANO and all. 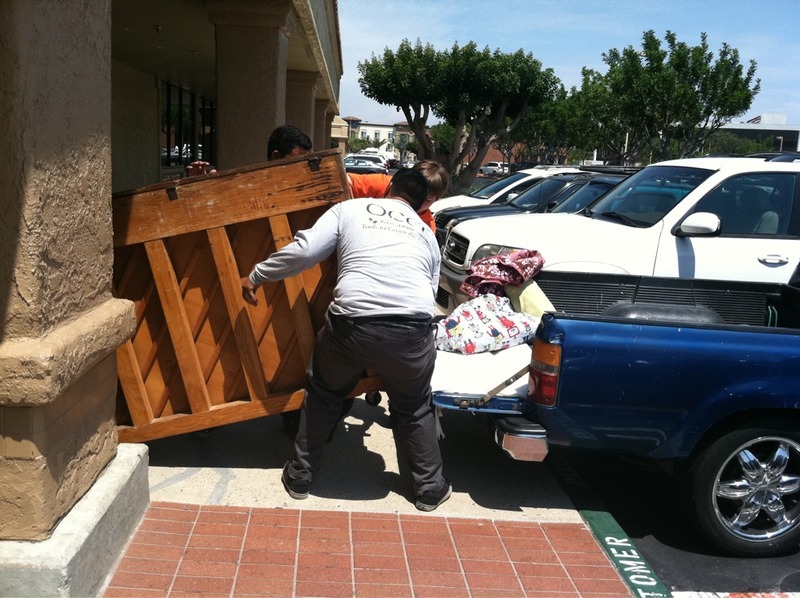 Monday was a holiday, so I had to quickly find some piano movers. I did a google search and found plenty of online listings, but here’s the problem: none of them, and I mean NONE OF THEM, had an email address on their website. They all just listed a phone number. I am here to tell you, piano movers are living in the dark ages. And me, on the other hand . . . for some reason I just can’t bring myself to make phone calls anymore. I knew I was under the gun to find a piano mover, but I just kept googling and googling, and then abandoning my search and playing around on Google+ because a phone call? It’s JUST TOO HARD. I mean, calling someone? And then talking, or maybe leaving a message and then having someone call me? The mere thought of it was just too overwhelming to bear. (May I remind you that I am the person who kept two Netflix movies for nine months because I couldn’t find the strength to call customer service and request a new red envelope). Finally, Tuesday rolled around, and despite several more google attempts I had still not been able to find a single piano mover with an email listing. And instead of just making a phone call, I decided it would be easier to take matters into my own hands and handle the piano moving on my own. With five kids in tow. (Jafta had a friend over). My first brilliant idea was to rent a truck from the U-Haul store and then hire one of the day-laborers that stand en mass near the entrance to drive it for me, while I followed behind in my car o’children. When I pulled up, about ten men surrounded my car trying to be chosen for the task. I ended up with Johnny because he had a driver’s license. which, in my mind, was merit enough to trust him with driving a car I was about to rent. When I recounted this story later to Mark, he did not agree with my logic here. Fortunately, Johnny let me know before I rented the truck that he had is own truck. “Tengo un gran camión.” he said. I decided to just hire Johnny and a friend, and use their truck instead of renting one. I am going to venture to guess that U-Haul would not be thrilled that the workers they allow to solicit on their property are diverting their business, but it worked out quite nicely for me. Johnny disappeared to go get his grande truck, and then showed up with a truck that was a bit more pequeño than I expected. But by this point, I was just ready to get the show on the road (mostly congratulating myself for working this out without making a phone call). I texted Mark to let him know my plans, and reminded to me to make sure I had some blankets and tie-down straps. I informed him that I did not, but that there was a yoga mat in the car. After a sigh about my husband and his annoying logic and all, I asked Johnny if he had any blankets and strap-ons. Which I realized, about 5 seconds too late, is not the same thing as blankets and tie-down straps. Finally. our minivan/tiny truck caravan set out towards Garden Grove (after a pit stop at my house for blankets). If you know anything about Orange County, you know that Garden Grove is pretty much the Mordor of the OC. After a twenty-minute drive, I turned into the parking lot of the thrift store and watched as Johnny sped past me, following closely behind another gray minivan. I lost them. AND THEY HAD MY BLANKETS. I thought for a few seconds about what to do, and decided that a high-speed pursuit was the only logical option here. I took off in the direction of Johnny’s tiny truck, but I didn’t find him. After about 15 minutes of looking, I started to despair, because 1) I had just wasted an hour of an already busy day, 2) I was starting to worry that this situation might end in me having to make a phone call, even though I never got Johnny’s number, and 3) I had been listening to Jafta mutter about his robot comforter for 15 minutes, including numerous threats about how I would owe him $20 if the comforter was not recovered. 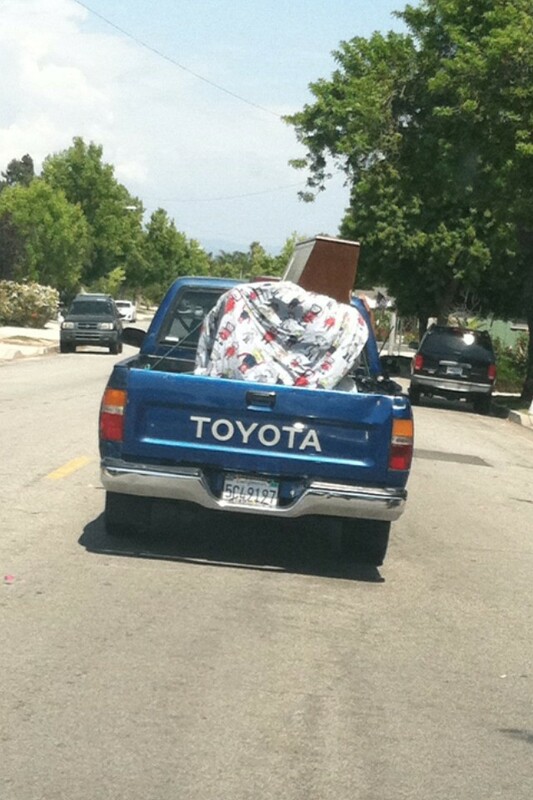 Luckily Johnny, his tiny truck, and the robot comforter showed up a few minutes later. Finally, our piano was wrapped in the robot comforter, secured with strap-ons bungee cords, and made the journey back to Middle Earth. I was pretty nervous the whole drive, because the piano looked a little precarious. But also, I was a little proud. Because I have a piano in my house. And I didn’t make one single phone call to get it there.